A recently discovered manuscript by a Hungarian artist provides detailed memories of World War I, close to the ground and close to the front. Edited and translated by the author’s grandson, this memoir—likely never intended for publication—covers eight months that would shatter, topple and transform the world of the 29-year-old artist in a country to which he returned home a stranger. It begins with him on vacation with friends, an idyll interrupted by the news that war has been declared and he has been conscripted into the army. 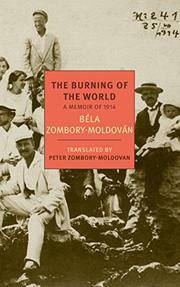 “There had been no war in Hungary for almost seventy years,” writes the author. “This was the twentieth century! Europe at equilibrium in the era of enlightenment and democratic humanism. It seemed impossible that a dispute should be decided by fighting.” Though he declared war was “an anachronism,” it is the belief that the era of warfare was over that now seems quaint, and the soldier soon found himself in the midst of the unthinkable violence of the war. Badly wounded three months into his service, he was sent to the hospital and then home, a changed man in a world he no longer understood and where he could never again feel at home. “[S]uffering and the fear of death—indeed, death itself—look different from the perspective of the hinterland than they do to someone taking part,” he writes. Eventually, the author attempted to resume his life and return to his art among people who did not share his life-changing experiences. “I just wanted, like a humble little brook, to join in the great swelling flow of life,” yet, as his account suggests, neither he nor his art could ever be the same again. A personal footnote to the war’s exhaustive history that makes that history come alive.